Looking back on that closet room without a door I needed to stop and take a crying break, but at the time it wasn’t so traumatic. I just thought it was normal, but I was beginning to realize it wasn’t. I can remember being so scared in that room, but I didn’t think anything of it. You don’t when you’re a kid. It occurs to me that my mother was probably a Wah Wah adult too. I remember a lot of incidents that she had a part in but she didn’t seem completely present. When I was very young, barely more than a toddler, I was allowed to visit a neighbor who lived a block or so down from us on Lancaster Crescent. In my mind, this is a combination of just plain negligence AND a sign of a simpler time. Around the same time (when I was two or three years old) I was involved in an incident with a closer neighbour. We lived beside a small local firehall. The firemen were very accommodating to us kids and I can remember visiting the firehall and even once in awhile being allowed to ride on the fire truck to the end of the driveway when they brought it out to wash it. He particularly didn’t like our dog Hamish who from what I can gather was taken to using his yard for a washroom. I only really know my own part in this, but I can tell you that Hamish was a very well behaved Border Collie. I have pictures of him with his snout in my baby bassinet in protection mode. He also used to push my brother and I back into our yard if we wandered too far towards the gate. Hamish died when I was 6. He was struck by the fire truck which was on an emergency call. Our other dog Put Put had run out onto the road just as the truck was coming and Hamish ran out and pushed Put Put out of the way and was hit. Hamish died saving Put Put’s life. I’m trying to give you an idea of what Hamish’s personality was like and how I felt about him as a child. The aforementioned troll of a neighbor threatened Hamish with his shotgun. ” If that dog comes into my yard again I will pull out my gun and shoot him.” He menaced. I’m not sure if I heard about this from my mother or if I was actually there when he made this threat, but I knew I had to do something. I should mention how frightened I was of this evil man and his shotgun and his threats against my dog. Why should a 3-year-old kid know about these things? I took my tricycle which had the safety grips conveniently removed from the handle bars and I rode slowly along the side of his car that was conveniently parked on the street. 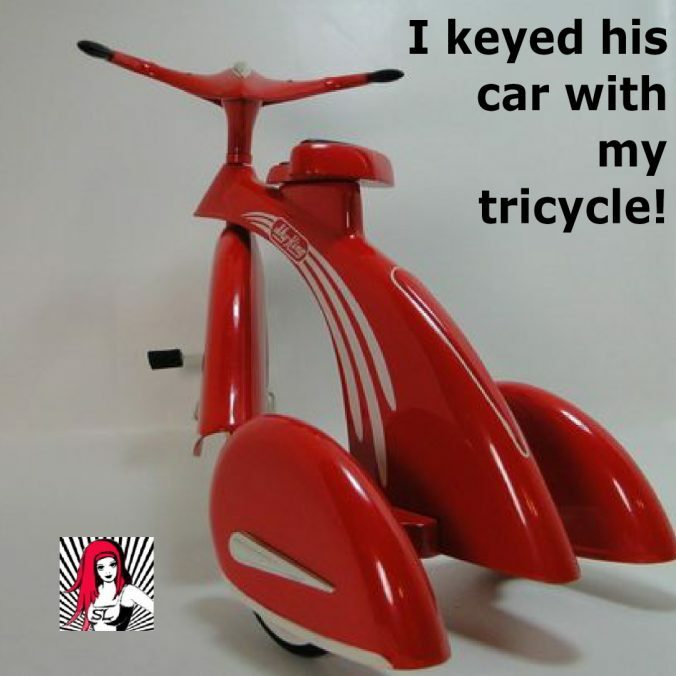 I keyed his car with my tricycle! “No mommy” I replied with my prettiest little innocent girl face. “She didn’t do it.” my mom told the troll and as far as I know that was the end of it. Are you wondering where my mom was during all of these goings-on? Why she wasn’t watching her 3-year-old daughter and why she didn’t keep Hamish in our yard and clean up his poop by herself? I feel the need to defend her here. To say that she had my brother, who was 18 months younger than me to look after too. I want to say that things were different back then and to a certain degree they were. But the question is still in my mind.